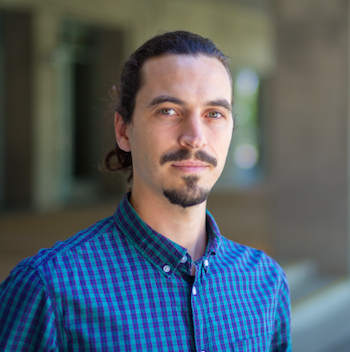 A 1/2° resolution global ocean general circulation model is used to investigate the processes controlling sea surface cooling in the wake of tropical cyclones (TCs). 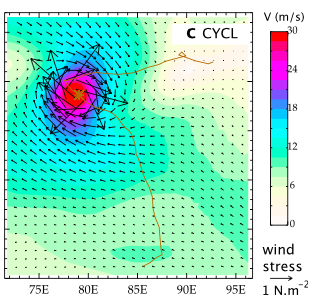 Wind forcing related to more than 3000 TCs occurring during the 1978–2007 period is blended with the CORE II interannual forcing, using an idealized TC wind pattern with observed magnitude and track. The amplitude and spatial characteristics of the TC-induced cooling are consistent with satellite observations, with an average cooling of ∼1°C that typically extends over 5 radii of maximum wind. A Wind power index (WPi) is used to discriminate cooling processes under TCs with high-energy transfer to the upper ocean (strong and/or slow cyclones) from the others (weak and/or fast cyclones). Surface heat fluxes contribute to ∼50 to 80% of the cooling for weak WPi as well as away from the cyclone track. Within 200 km of the track, mixing-induced cooling increases linearly with WPi, explaining ∼30% of the cooling for weak WPis and up to ∼80% for large ones. Mixing-induced cooling is strongly modulated by pre-storm oceanic conditions. For a given WPi, vertical processes can induce up to 8 times more cooling for shallow mixed layer and steep temperature stratification than for a deep mixed layer. Vertical mixing is the main source of rightward bias of the cold wake for weak and moderate WPi, but along-track advection becomes the main contributor to the asymmetry for the largest WPis.